I’ve never been to chuck e cheese… McDonald’s? “So he’s yanking and Ben is drowning and Nate is having problems and I’m yelling and people are watching and my wife is pretending she’s not with us….” This line had me cracking up so much! But the very serious questions come shortly after; “Why is it so tempting to grasp things that don’t really matter? Why can’t we see when we are drowning in our own stubbornness?” You hit the nail on the head with this post. Thanks for sharing! So true Scott. Great post….The relief that comes from dropping the balls is well worth it, but you are right, its not easy to actually let them fall from your hand.. Blessings to you! I loved this! 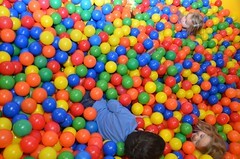 I have also seen kids drowning in balls a Chuck E. Cheese. 😉 What of those who seem to have never had anything else but the balls? wanting it bad enough is everything, isn’t it? Beautiful post! Scott, I agree. When people go to counseling, they already have a solution for their problem. Some of them are not aware of it, while others are so aware of the changes they need to make that they decide to block those thoughts. Change is sometimes painful and most of the time, scary. You are right. Whether people know the solution for their problems or not, for some reason they come to counseling to ask permission to take the next step. …This gives the term ‘ball-buster’ a whole new spin, lol. Thanks for this great post.